Centaurus A is the closest active radio galaxy, a giant elliptical galaxy about 11 million light years distant. The composite view (left) combines X-ray, optical and radio images (right). In the optical, the central band of the galaxy is obscured by gas and dust. 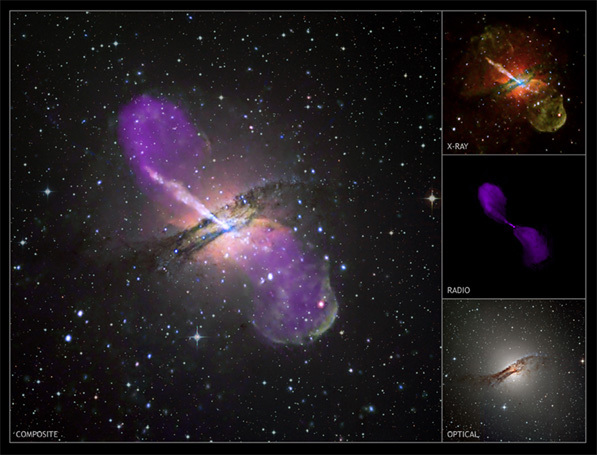 In radio and X-rays, the jets emerging from the central black hole are well visible. Credit: X-ray - NASA, CXC, R.Kraft (CfA), et al. ; Radio - NSF, VLA, M.Hardcastle (U Hertfordshire) et al. ; Optical - ESO, M.Rejkuba (ESO-Garching) et al. See also APOD. Centaurus A (e.g. Israel 1998) is one of the nearest active radio galaxies, powered by a supermassive black hole of about 50 million solar masses at its center (Cappellari et al. 2008). Centaurus A is a little over 3 Mpc distant and shows two jets emerging from its nucleus, with giant radio lobes stretching out to 250 kpc, extending over a 8 by 4 degree field on the sky. The angle between the jets and the line of sight is uncertain; estimates range from 15 to 80 degrees, as opposed to blazars where a jet is pointed right towards us. Cen A was detected at MeV to GeV energies by instruments of the Compton Gamma-Ray observatory (Steinle et al. 1998). 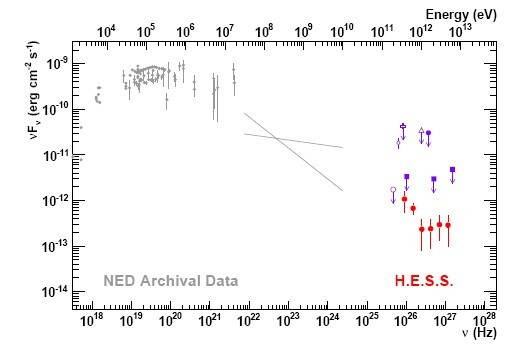 As the nearest active galactic nucleus (AGN), it was the target of observations with several generations of Cherenkov telescopes, but apart from an early tentative detection in the 1970s (Grindlay et al. 1975), only upper limits were reported concerning emission in very high energy (VHE) gamma-rays. 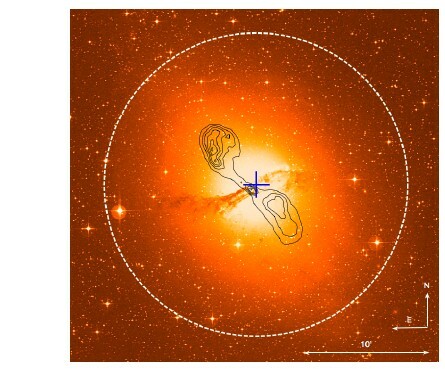 Most recently, Centaurus A attracted attention as a possible source of ultrahigh energy cosmic rays (UHECR), with several AUGER UHECR events clustering near Centaurus A (Auger Collaboration, 2007), although the statistical significance of this enhancement is not overwhelming. A UHECR source is likely to emit gamma rays at some level, either produced in the central accelerator engine or by interactions of UHECR; assuming that the energy output in UHECR and gamma rays are of the same order of magnitude, one might expect a source strength of order 1% of the Crab flux. In 115 h of H.E.S.S. data accumulated between 2004 and 2008, indeed a faint signal is visible, centered right at the core of Centaurus A (Fig. 1, Fig. 2), with a statistical significance of 5 sigma and a flux of 0.8% of the Crab flux. While only a relative poor upper limit on the source size of 0.2 degr. could be obtained, the angular distribution is consistent with a point source. The energy spectrum of VHE gamma rays roughly connects to the spectrum obtained by Compton GRO at lower energies (Fig. 3). No variability is seen in the H.E.S.S. data, but given the faint flux, only large flares - such as a brightening by a factor 20 over a night - would be detectable. A wide range of mechanisms for particle acceleration and gamma-ray emission is discussed for this object in the literature - see discovery paper for references - but more precise data will be needed to distinguish different emission processes. Centaurus A is rather unique among very high energy gamma-ray emitting AGN in that it is close enough that emission from even the inner jets may ultimately be resolved by Cherenkov telescopes, giving new insights into the physics in the VHE domain. Reference: "Discovery of very high energy gamma-ray emission from Centaurus A with H.E.S.S", H.E.S.S. collaboration, F. Aharonian et al., Astrophysical Journal Letters, 695 (2009) L40-L44. Fig. 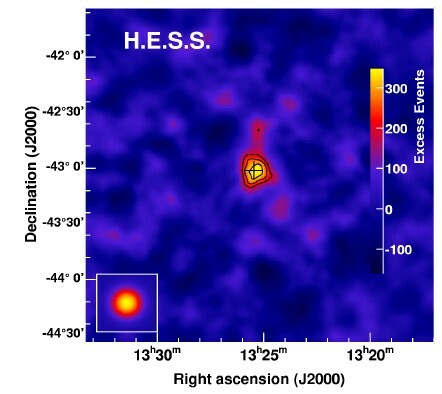 1: Smoothed gamma-ray sky map of the region around Centaurus A. The cross indicates the position of the radio core of the active galaxy. The inset illustrates the effective point spread function of the instrument including the effects of smoothing, showing that the source appears point-like. Fig. 3: Spectral distribution of the emission from Centaurus A, from X-rays to the VHE gamma-ray energy band. Archival X-ray and EGRET gamma-ray data are shown in grey, previous VHE upper limits and the tentative early detection in purple.